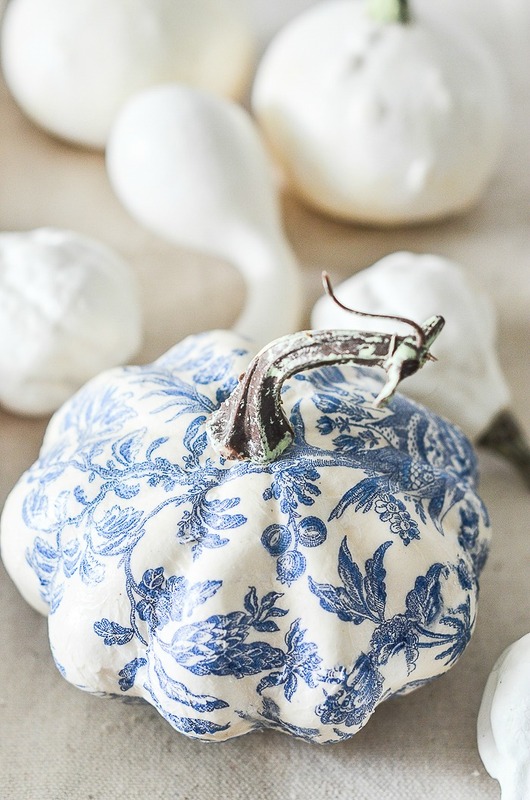 Chinoiserie pumpkins are a beautiful addition to fall decor and they are sooooo easy to make! 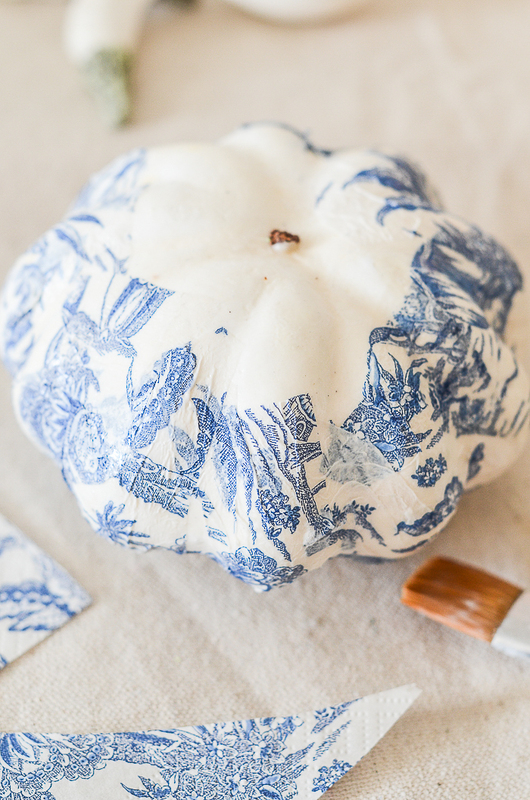 You really don’t need to be crafty to make these blue and white mini pumpkins! All you need are three things to make them! Yup… three! Small faux white pumpkins, Mod Podge and cocktail napkins! 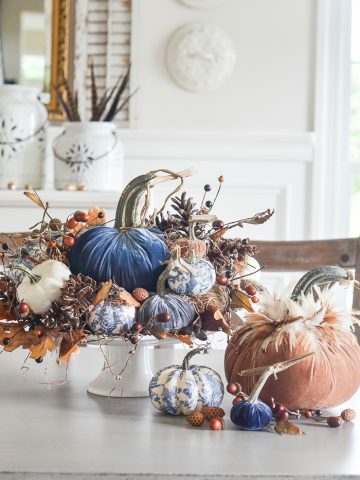 In no time you can have a pumpkin patch of the most stunning chinoiserie pumpkins! Today on Decorating Tips And Tricks we are ANSWERING VIEWER’S QUESTIONS. I think these are my favorite episodes. I really feel we are talking right through the microphone and helping you, our precious listeners! 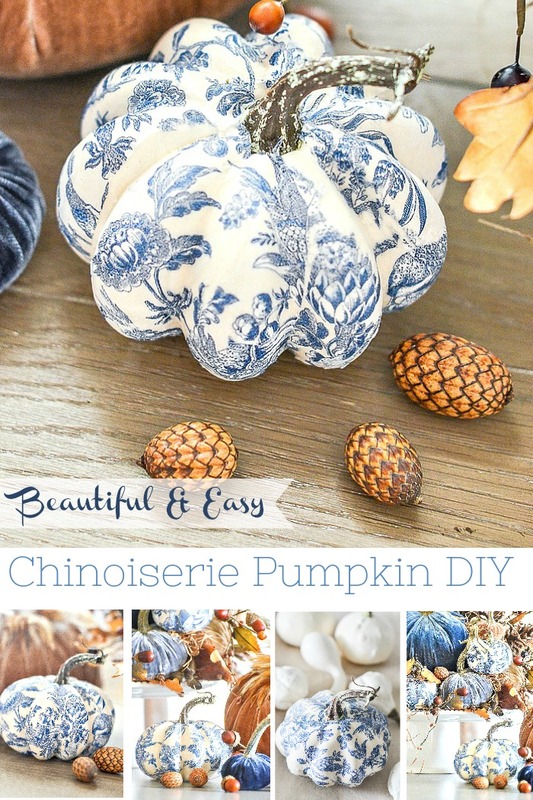 I made the instructions for these really beautiful chinoiserie pumpkins is very detailed. I am holding your hand and cheering for you! I’m so excited for you to make these pretties! These pumpkins came out even better than I thought they would. 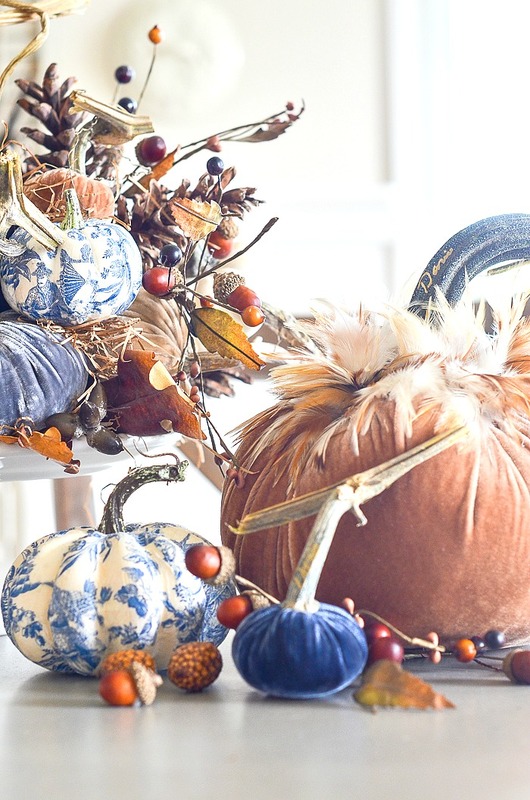 Here are a few things to help make your chinoiserie pumpkins amazing! this diy is not rocket science so don’t get stressed! I used one napkin per these pumpkins. The size of the pumpkin will determine how any napkins you will use. 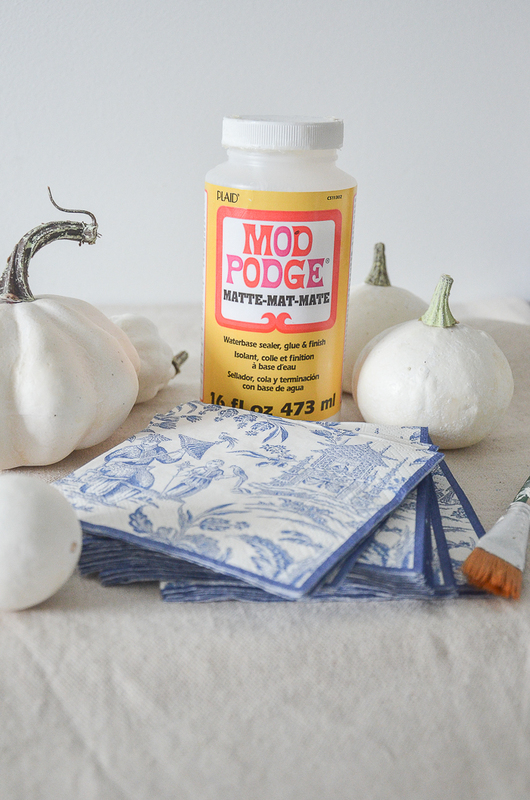 Don’t drench the pumpkin or napkin with Mod Podge. Make sure you have a nice even layer. First, cut the cocktail napkin to make a circle as shown below. Make the circle about 2/3 the height of the pumpkin. The napkin I used was 3 ply. Separate each ply and only use the top layer printed with the chinoiserie pattern. Remove the pumpkin stem. Just pull and it will pop right out! 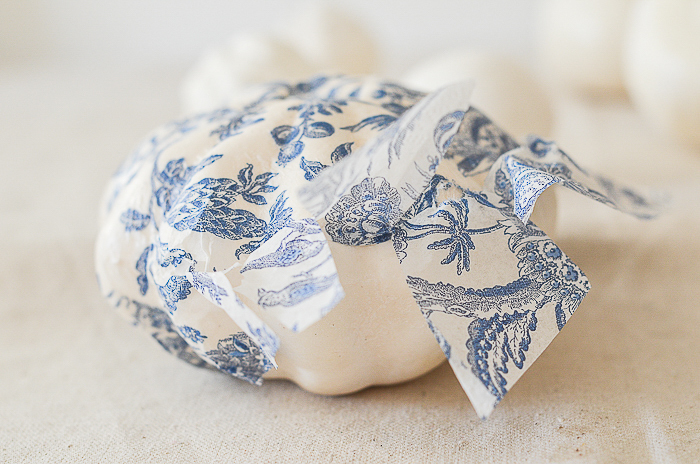 This will make it easy to lay the napkin over the top of the pumpkin preserving the chinoiserie design. Paint Mod Podge over the top 1/3 of the pumpkin. Again, don’t worry if the tissue tears, just position it again. 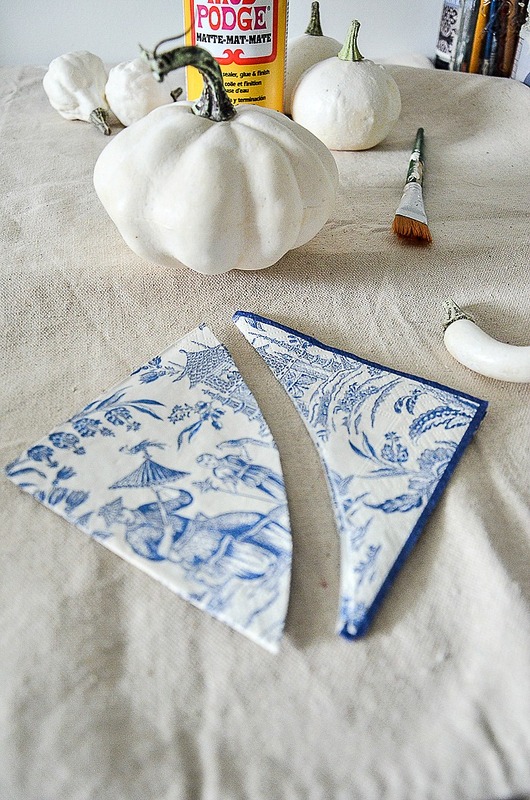 Lay the chinoiserie tissue over the top of the pumpkin with the middle of the circle over the hole where the stem was. Paint Mod Podge over the top of the tissue and gently press down. Only paint over the tissue as far down as it has adhered to the pumpkin. Here’s another big hint. I use a little bit of Mod Podge on my finder and smooth out any wrinkles. The tissue is delicate so don’t rub it too hard. If it tears no problem, put a patch of chinoiserie paper over it. Using scissors cut the tissue that is not glued down into strips. One by one, paste each strip down to the pumpkin. 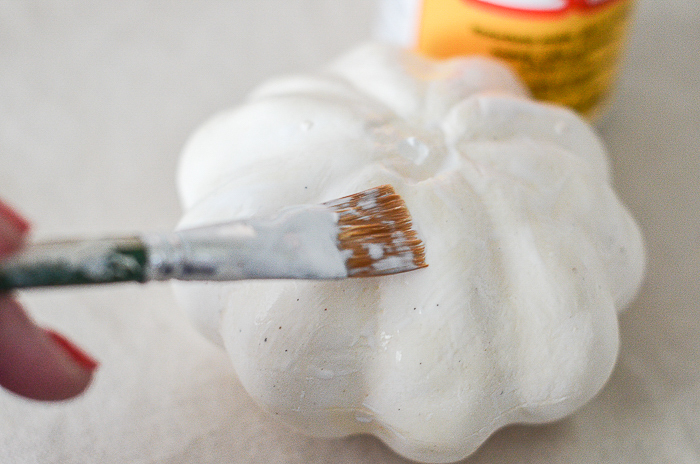 Add a little bit of Mod Podge to the pumpkin and then smooth the tissue down on the pumpkin using your brush and finger with more Mod Podge. The strips will overlap a little and you can cut any excess off as you go along. 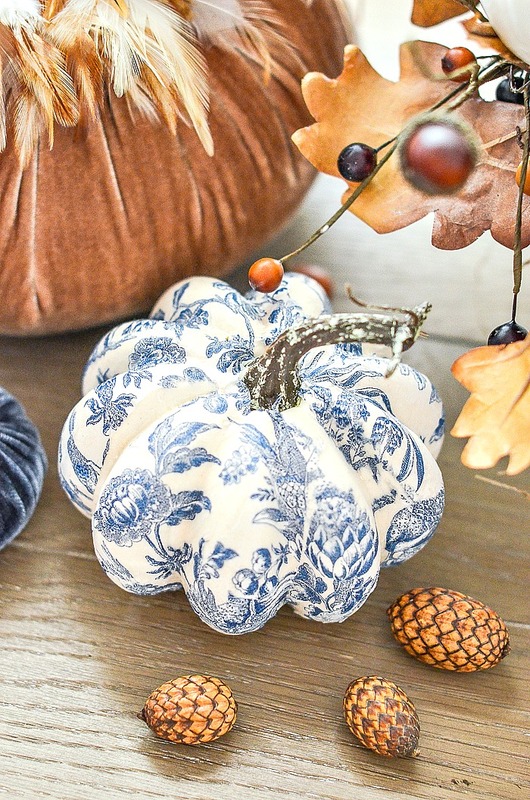 What makes these pumpkins so beautiful is that most of the pattern is intact and not patchworked together. Once all the side strips adhere to the pumpkin and it is dry, turn it over. Cut and rip the tissue into a shape that will fit 1/2 of the bottom of the pumpkin and adhere using the same process above. Finish the final piece of tissue the same way. I first cut a piece of tissue a little larger than I needed and then tore the edges to fit. Let the pumpkin completely dry. I poked through the hole through the chinoiserie paper in the top of the pumpkin with the back of a small paintbrush and then put the stem back in. Notice how beautiful the top of the pumpkin looks! The chinoiserie design is totally intact! This diy is so easy-peasy! 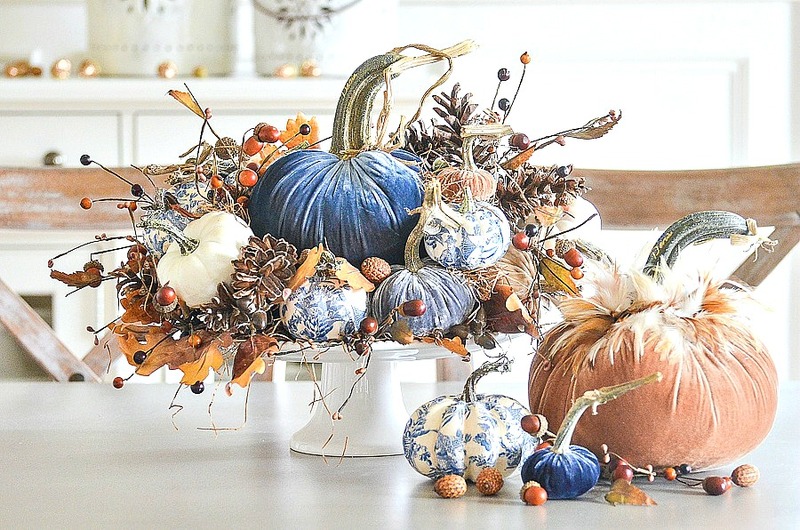 In in a fall arrangement, they steal the show! Click on the arrows to see other products. Click on the images to get them. The possibilities are endless. 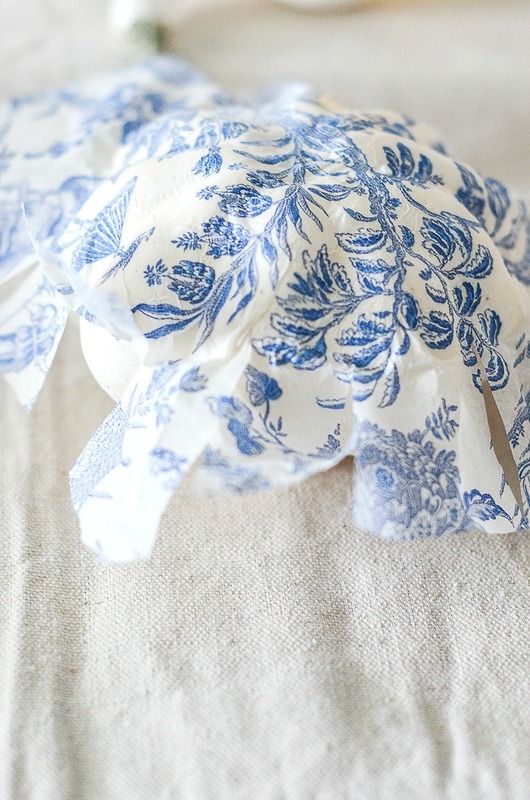 If blue and white is not your style you can use any cocktail napkin! Think of all the delicious patterns and colors your pumpkins could be! This is a wonderful idea . I want to make them and a table runner for a gift for friends. Love your website. Encouraging and just enjoy the ideas. I love to decorate my home. Love this tutorial. Can’t wait to try this. Sure hope I can find some pumpkins and pretty napkins. the arrangement is beautiful; how did you get everything to stay on the cake plate? It’s so beautiful. Thanks for sharing your talent with us again. These look fantastic! Now while fall items are on sale I’m going to buy a bunch and try them! Thank you for the tutorial. Yvonne, I love your use of designer napkins for the beautiful chinoiserie pumpkin! It turned out just lovely. I’ve chosen you as one of my features on Share Your Style this evening. I hope we’ll see you at the party! I’m usually not a fan of blue but these are stunning along with the autumn colors you have chosen. It goes so well together. I ordered some of the napkins on Etsy. Can’t wait to make these. I have been decoupaging pumpkins for many years but never did them the way you demonstrate. I’ll have to try your way for this pattern. 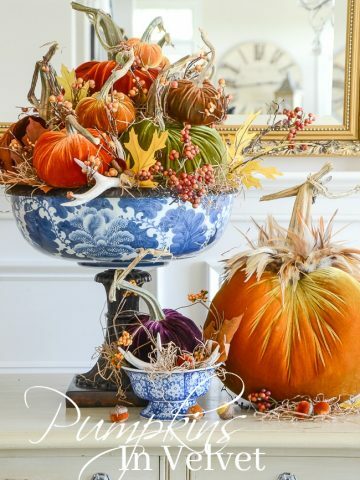 I have a friend who loves blue and I’ll make her a couple of pumpkins for Thanksgiving. She’ll love them! I love this idea! Since I would rather have a different color, I just spent 30 minutes browsing beautiful paper napkins on the internet. Can’t wait to try this. I love this idea! I just spent 30 minutes browsing beautiful paper napkins on Amazon. I found a floral design that has the phrase Friends Gather Here in small enough writing that it should work on a slightly larger pumpkin. Such a clever craft project! I love the print you chose! Beautifully done…love the color combinations. Thank you for the tutorial. Happy Fall! 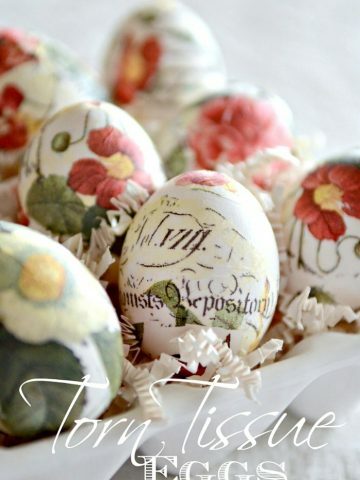 LOVE this craft idea! Your pumpkins are just beautiful. I have been in gray mode with my house for awhile. I absolutely love the blue and thing I have some new projects to tackle! Thanks for the inspiration! These are brilliant!!!! so easy and pretty and the possibilities are endless! They are beautiful! Thank you for the detailed tutorial. 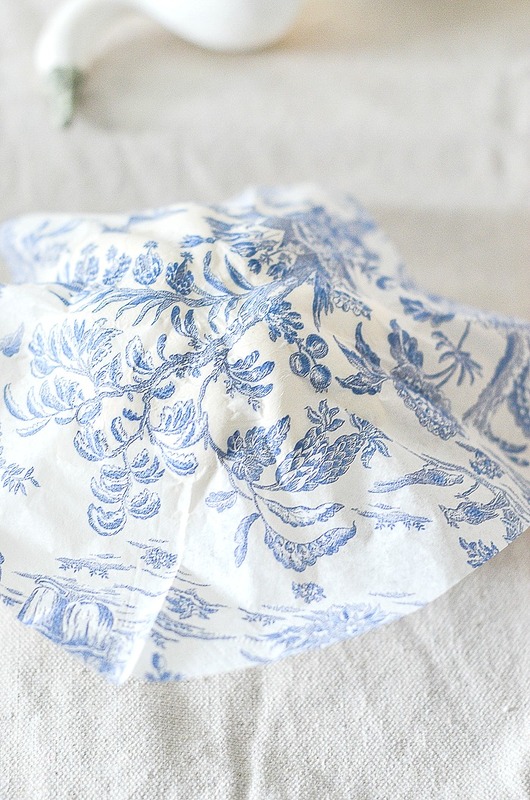 Saving to Pinterest and going out to find some great toile napkins. Thank you, thank you, thank you! 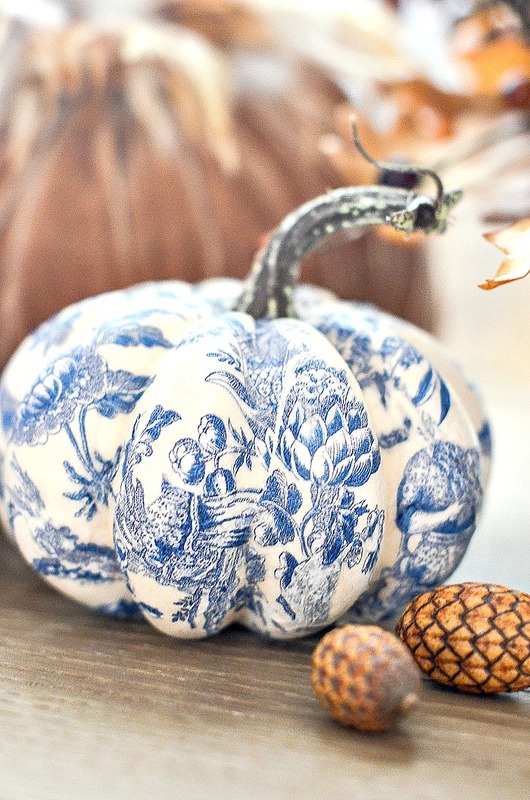 I love toile and I love these pumpkins! ? I know! thanks for your lovely comment! I LOVE these Yvonne, thankyou for the diy. I really want to try this myself! What a beautiful DIY project. Thanks for sharing these thorough instructions. I have some left over silver leafing I may try to add a tiny bit to the stem to give it a small shimmering hilight. So pretty and an easy project.Lovely addition to your collection. This is so attractive and I love how you used it with the velvet pumpkins! To Colleen – Caspari paper goods can be found at high end card stores and even some of the Hallmarks I have been in carry them. YES! When I found them on Amazon I knew they would be beautiful napkins. These are beautiful! Funny how blue goes with orange so well too. May I ask where you found the napkins? I’ve never seen any so pretty! Oh my gosh these are gorgeous and so simple! 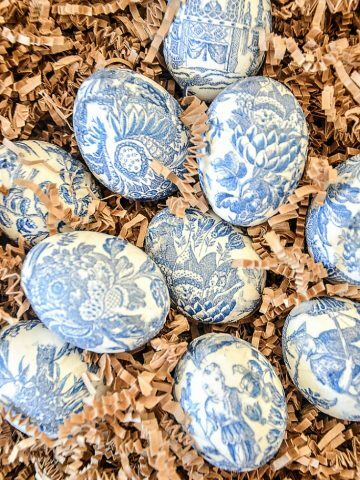 I love blue and white, but also love the idea you could use any color or pattern of napkin. Now I want to make some! Thank you, what a fun project this is going to be. I love the idea of giving them as gifts. Hi! Love your style! A year or so ago you featured a plaid throw for your porch and I lost the link to it. Do you know if it is still available? I regretted not buying it! 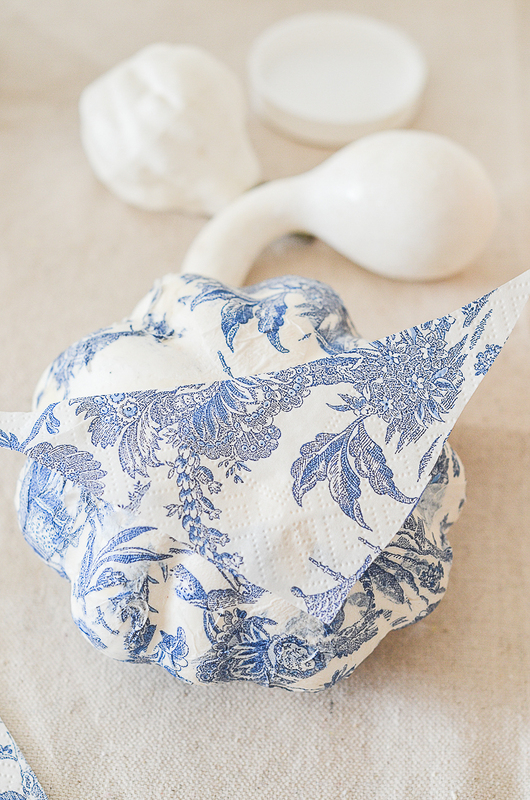 Love how Yvonne from Stone Gable made this Beautiful and Easy Chinoiserie Pumpkin DIY with designer napkins. I happen to already have some designer napkins here at the house.